Hard to believe we’re approaching mid-July already! We have a few more edtech workshops lined up throughout the month – and there is still time to register! Learn from members of the St. Louis (and beyond!) edtech community in engaging, hands-on sessions at EducationPlus. See the registration calendar here, and keep reading to see what’s being offered before the school year starts! Mark you calendar! Transforming Learning with a SMART Board (Level 1) takes place Thursday, May 31, 2012 at Cooperating School Districts’ tele. This workshop kicks off our summer professional development schedule and runs 8:30 a.m. to 3:30 p.m. This is a class for beginners with no prior knowledge of using the interactive aspects of the SMART Board. You’ll learn how this tech tool can improve the way you teach, plus excite learners. Discover how to find and develop lesson plans that make use of this classroom tool and motivate 21st century students. Cost: $149 CSD member; $189 non-member. No graduate credit is available for this course. Register for this SMART Board workshop here. Martha Bogart is wrapping up her SMART Board Level 2 class right now! 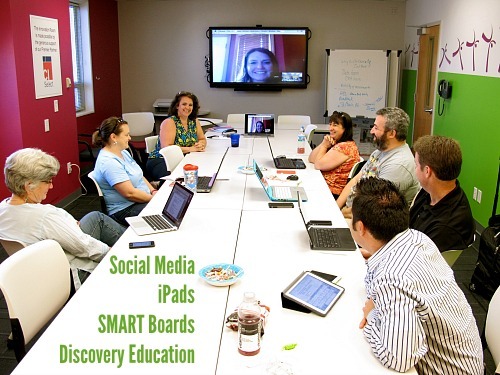 This workshop was for educators who already have a SMART Board and consider themselves users. They learned some of the advanced features of the SMART Board. With Martha’s help, they became adept at creating recordings on the SMART Board for future playback; they found out how to use the video player that comes with their SMART Board to annotate videos, plus much more. Look for more sessions to be offered this summer! Bill of Rights Day is next Thursday! This year marks the 220th anniversary of the ratification of the Bill of Rights in 1791. Bill of Rights Day has been a day of federal observance since 1941 – and the Bill of Rights Institute has a variety of fun and engaging activities to help your classroom celebrate this important anniversary. You can study the Bill of Rights in a variety of ways, including integrating technology into the lesson plan. Available on SMART Exchange now is a new SMART Board activity, Fight For Ur Rights. Use with large or small groups, as a warm-up or refresher, on our government, rights, and liberties; it’s informative and fun, and is great for teaching the Constitution and the Bill of Rights. Other Bill of Rights Day activities include signing the pledge to read the Bill of Rights on December 15th, ranking your rights, answering trivia questions, and taking a quiz about the Constitution and Bill of Rights. Visit this website to take advantage of these resources, plus other free lesson plans. It’s hard to believe, but this week marks the end of our summer tele classes. The final two classes of the summer are interactive whiteboard workshops- some of our most popular! Thursday is our last beginning SMART Board classs (Level I) of the season, followed by Friday’s beginning Promethean ActivBoard class (also Level I). Our fall and spring classes will be lined up soon, so keep a look-out for those topics and dates.